Water Jet cutting systems use a combination of water and an abrasive grit called "Garnet" to cut through materials considered too costly to cut by conventional cutting methods. Using small amounts of water, while eliminating the friction caused by tool-to-part contact, abrasive Water Jet cutting avoids thermal damage which can adversely affect metallurgic properties in materials being cut. The ability to pierce through material also eliminates the cost of drilling starter holes. Because abrasivejet cuts with a narrow kerf, parts can be tightly nested thus maximizing material usage. Abrasive Water Jet can cut through materials ranging from 1/32 inch (1.6 mm) to 12 inches (305 mm) thick with an accuracy of ± 0.005 inch (0.13 mm). 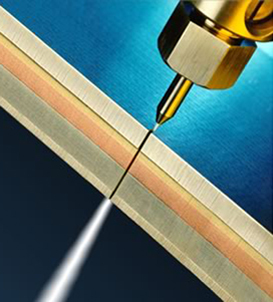 When coupled with our state of the art motion control system, abrasivejet cutting provides extremely accurate cuts with a high degree of repeatability over a wide range of materials and shapes.